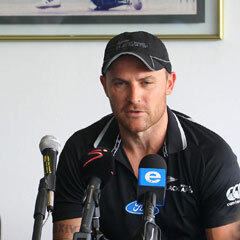 Durban - New Zealand captain Brendon McCullum was unapologetic for his team's approach after South Africa trounced them by eight wickets with 47 balls to spare in the first Twenty20 international on Friday. Fast bowler Rory Kleinveldt took two early wickets to start a slide from which New Zealand never recovered. Kleinveldt took the key wickets of Rob Nicol and McCullum before he finished with three for 18 to capture the man of the match award. South Africa romped home in 12.1 overs with new captain Faf du Plessis making 38 not out, while Quinton de Kock, making his debut four days after his 20th birthday, slammed a quick 28 not out. "We played some aggressive cricket and missed a couple of fundamentals on the way," McCullum said of his team's collapse to 86 all out after winning the toss, with several of the batsmen falling to over-ambitious strokes. "That is the way we are going to be, that is the way we are going to put them under pressure. We were probably a bit too keen, we were outplayed," added the captain, who said he expected a better performance in the second match of the three-game series in East London on Sunday. Du Plessis hailed a "fantastic" performance by the home side. "The bowling was fantastic, the energy on the field was awesome," he said. It was a disappointing start for New Zealand, who arrived as underdogs but were expected to put up a reasonable fight in the Twenty20 internationals. They were missing several key players, including former captain Ross Taylor, who was unavailable for the tour, and they suffered another blow when experienced batsman Martin Guptill could not play at Kingsmead because of a stomach ailment. Fast bowler Trent Boult was also unavailable because of a similar problem. On a Kingsmead pitch with pace and bounce, the tourists lost three wickets inside the first five overs. Nicol charged Kleinveldt and was caught behind, while McCullum top-edged a hook and was caught at fine leg. In between Peter Fulton drove Dale Steyn to mid-on. It did not get much better for the Black Caps although left-handed newcomer Colin Munro, who was born in Durban and did his early schooling in the city before his family moved to New Zealand, made 23. Doug Bracewell hit 21 not out. Steyn, newcomer Chris Morris and left-arm spinner Robin Peterson all took two wickets. New Zealand new cap Mitchell McClenaghan had Richard Levi caught at slip for a duck, bowling a wicket maiden at the start of the South African innings. But Henry Davids and Du Plessis put on 45 before the captain and De Kock finished the match.